We all need to new clients to make our businesses a success. It’s important that you have a way to get and retain customers, no matter what size your business is or how many clients you want. And you need a way to do that that can be done quickly and easily. Using templates for your communications is one way. Ask for referrals from your current clients don't wait for them. Word of mouth is one of the best ways to get new clients because you have already built trust and a relationship with the referring client. The potential referred client will be more likely to work with you based on that relationship. Browse job boards like Indeed.com to find jobs and new projects. 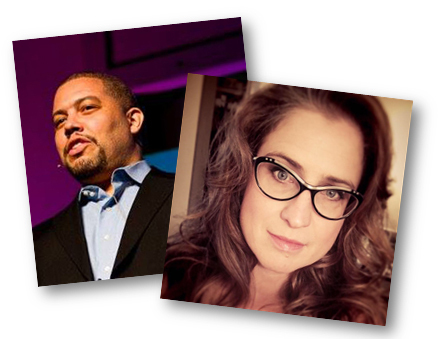 Start blogging and networking on social media. Blogging is a great way to begin building your authority and getting the attention of potential clients. Blogging and social media helps you build relationships with them. Getting and retaining customers is crucial to the success of your business. This guide will give you the tools you need to do just that. Show potential clients your services and offers benefit them. Use this list of 30 benefits to help you get started. Referrals help you build credibility and relationships with potential clients. 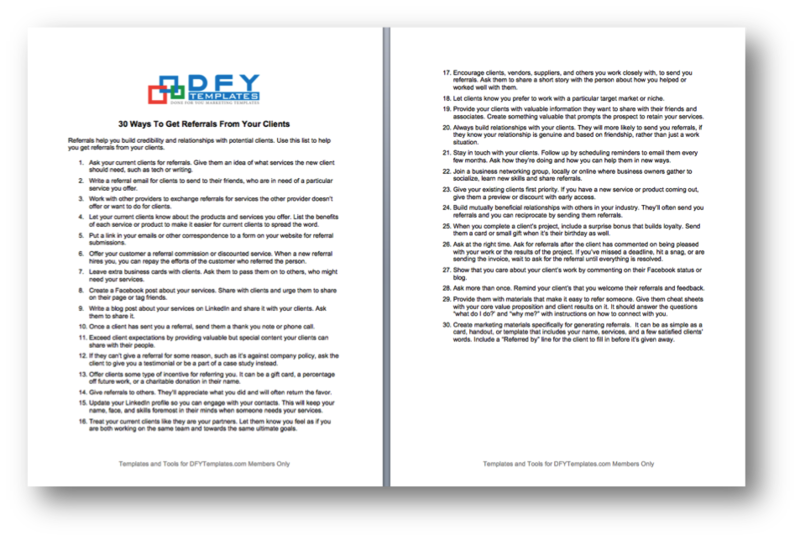 Use this list to help you get referrals from your existing clients in ways you may not have thought of. 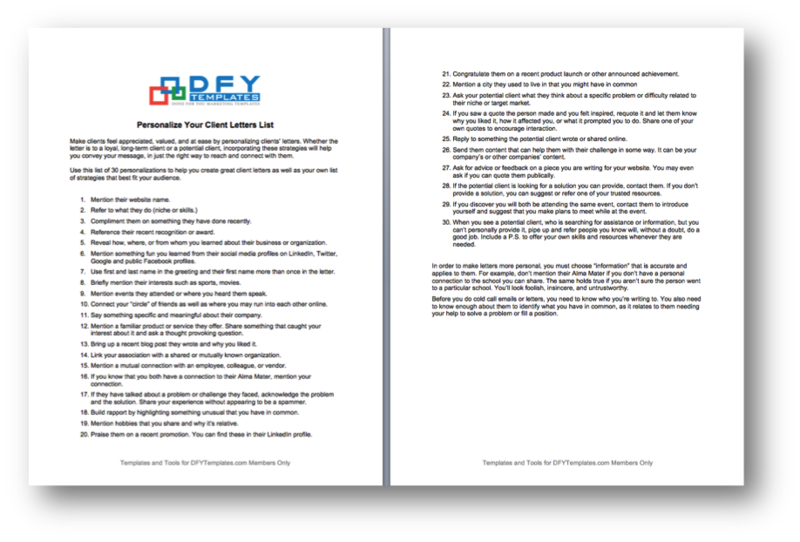 Use this list of 30 personalizations to help you create great client letters that will help you convey your message as well as make solid and meaningful connections. 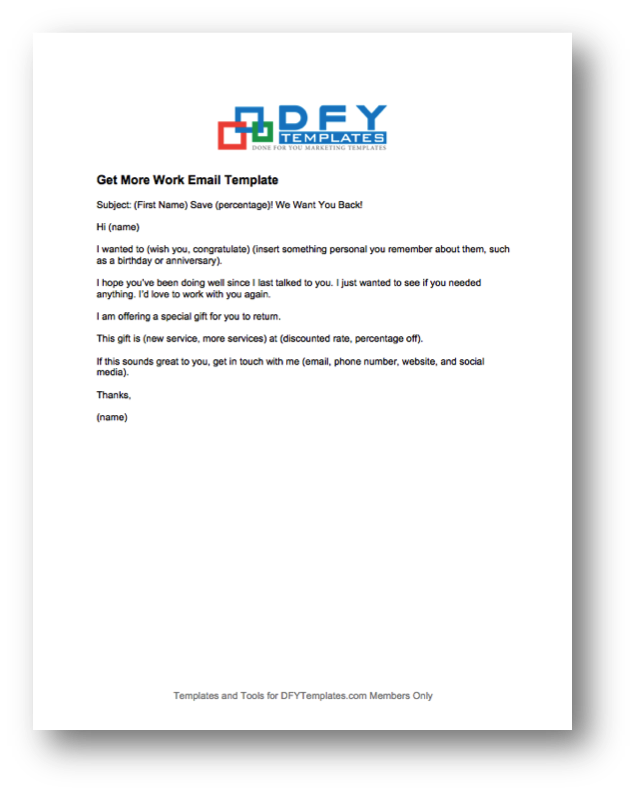 Use these email templates to reach out to potential clients you are interested in working with. 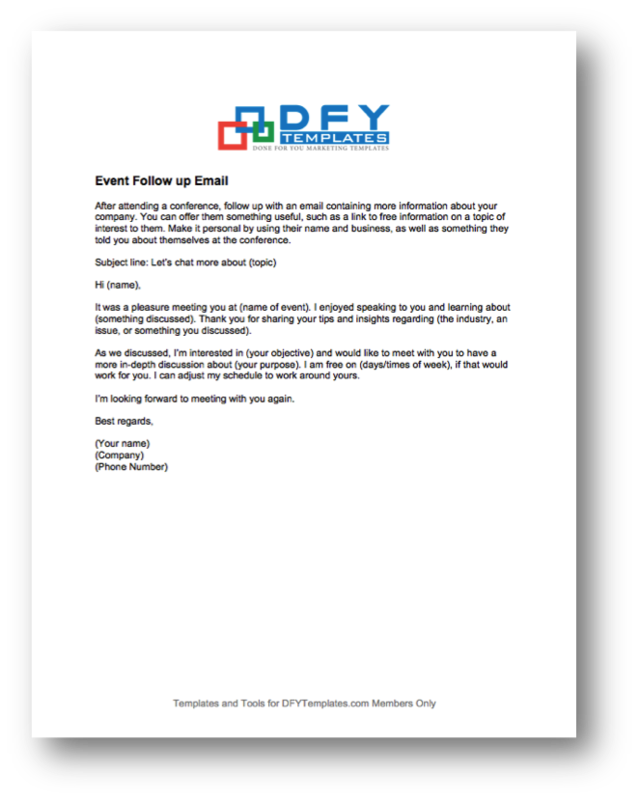 Use this email template to follow up with a potential client that you met at a live event. 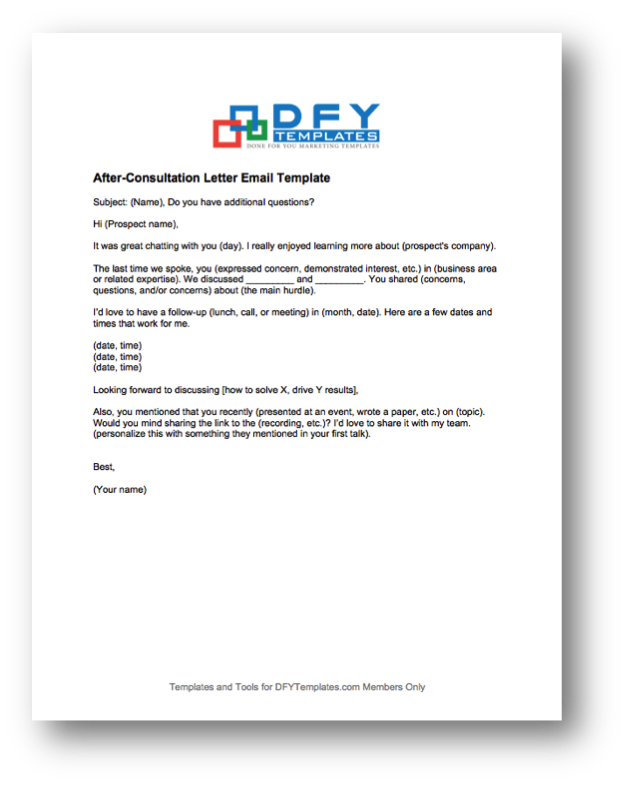 Use this template to send a thoughtful follow up after a consultation meeting. 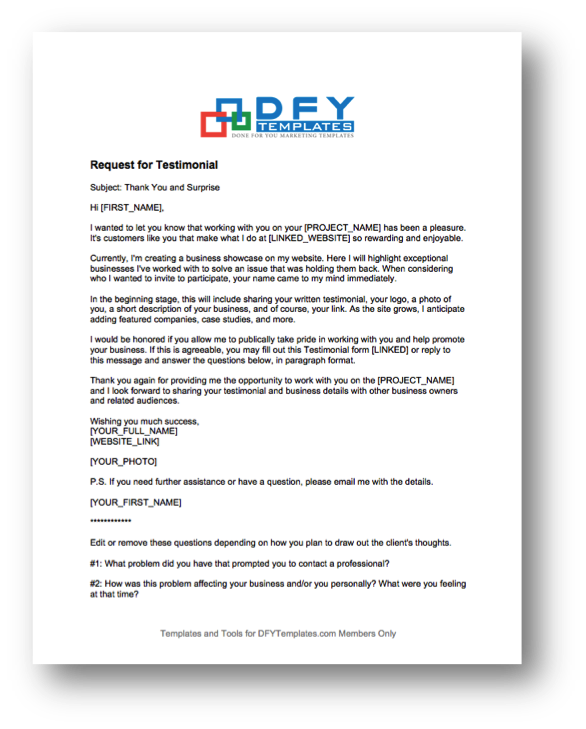 Use this email template to request a testimonial from clients you’ve successfully worked with. 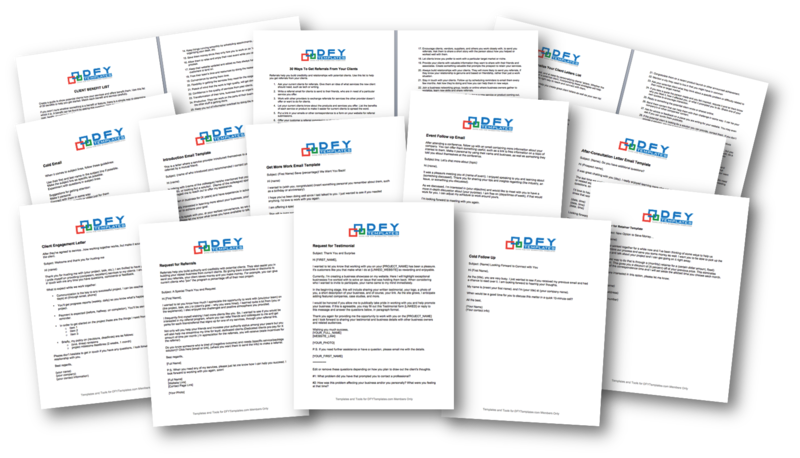 Referrals help you build authority and credibility with your clients. 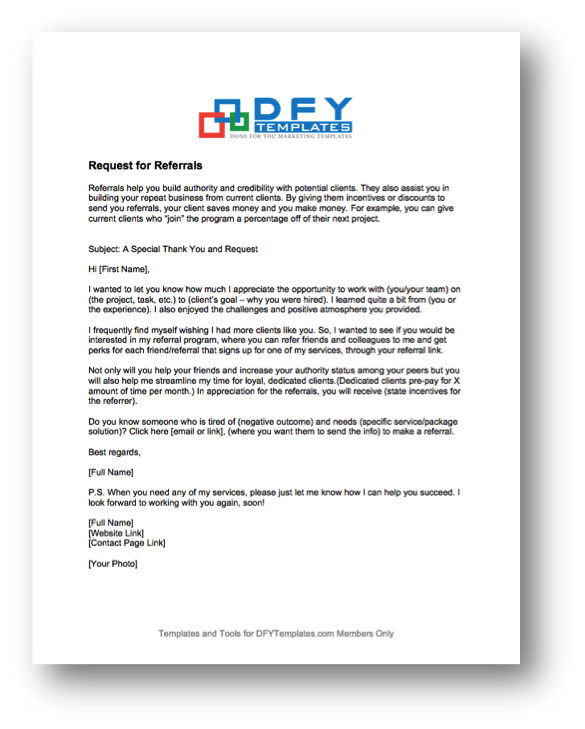 Use this template to help you request referrals from your existing or past clients. 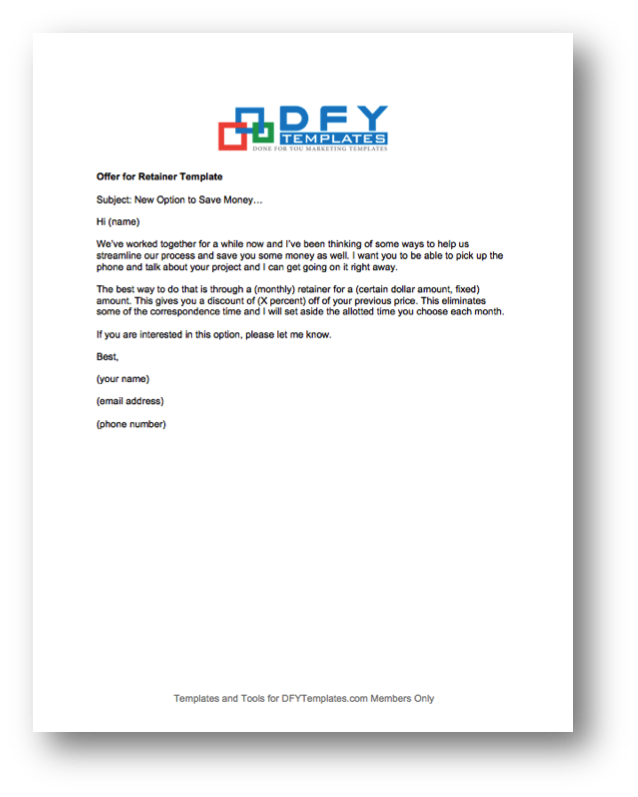 Use this template to offer gifts or incentives to clients you’d like to work with again. 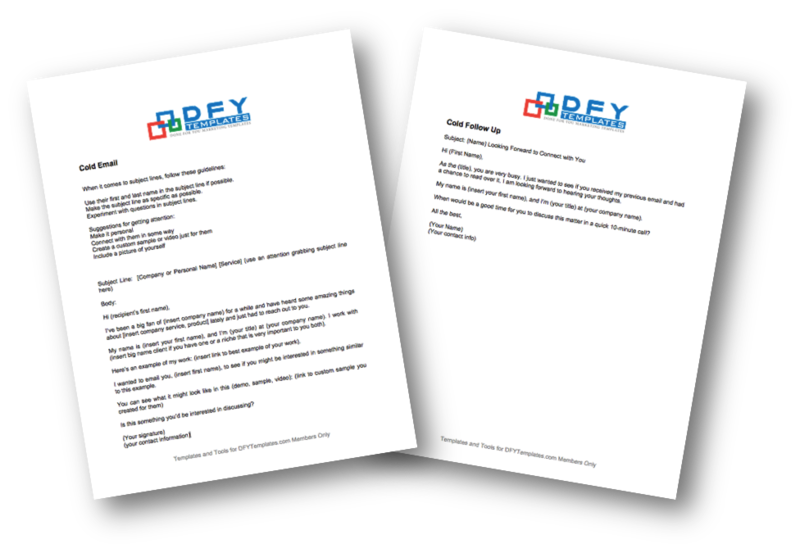 Use this template t offer a retainer package to your clients and explain the benefits. This template can be used to reach out to a potential client who was referred to you by a mutual friend. 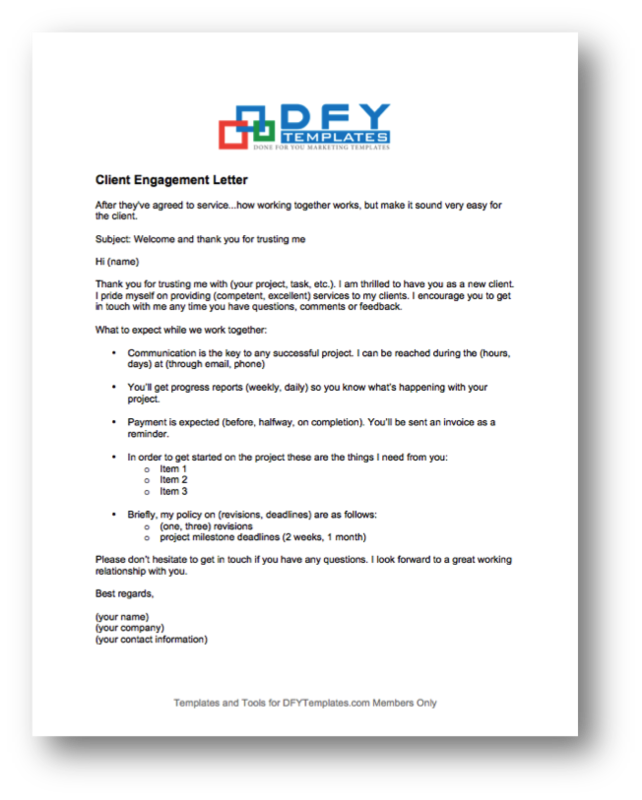 Use this template to send to your clients after they agreed to start working with you. 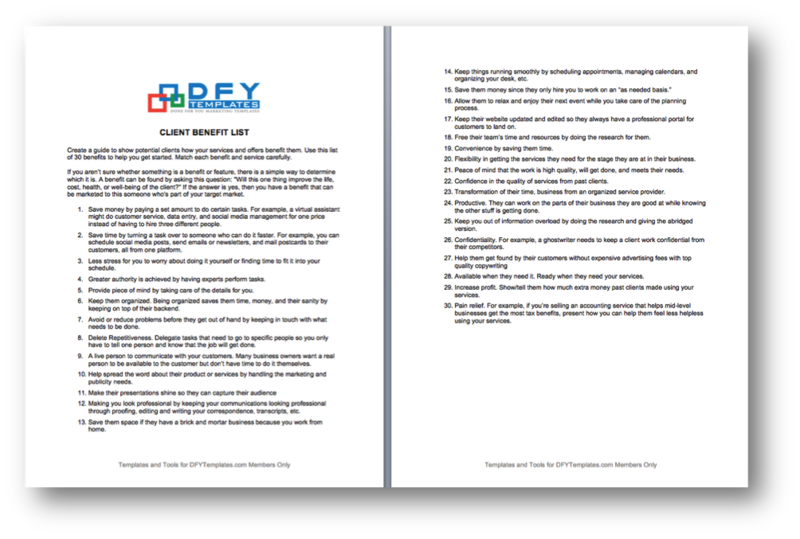 Template package for Client Aquisition. 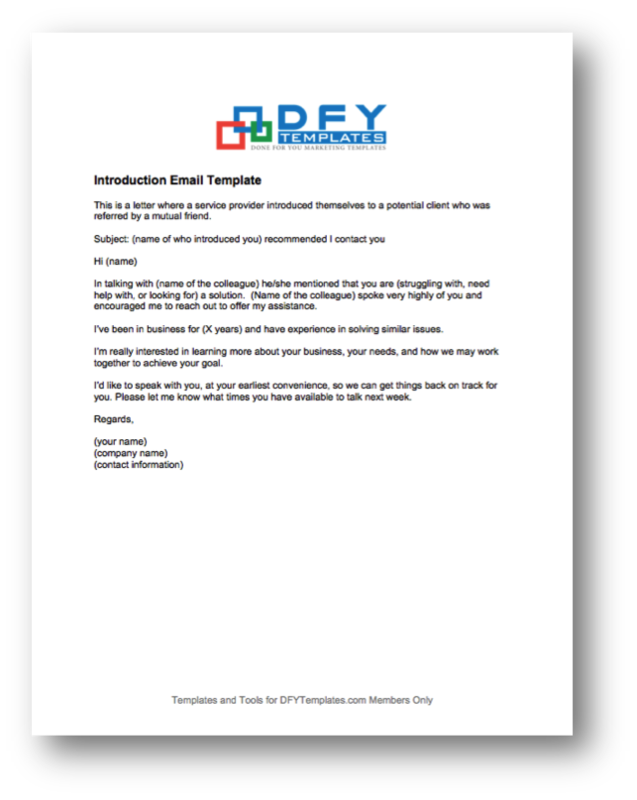 Template package for Client Acquisition.